Not too long after Thanksgiving I visited Seventh Son Brewery with my wife and our friends Tom and Mary. We ordered a couple of sampler trays and among the beers we tried I thought the most interesting one was Golden Ratio IPA. The brewery doesn’t offer a lot of details about this beer other than the fact that it is made with Southern Hemisphere hops. 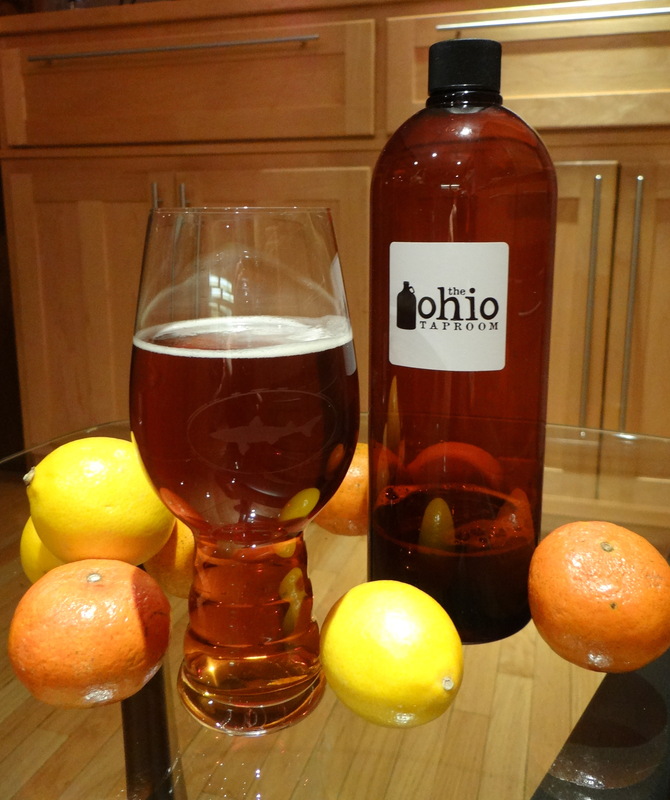 I’ve had a couple of pints of this beer in the meantime, and this past weekend I picked up a half-growler at the Ohio Tap Room to bring home for a proper review. There are not a lot of online reviews of this beer so I hope this information will be useful to some of you in the Columbus area. As you can see from the picture above this beer has a clear, deep amber color and pours with a relatively small amount of head. As you bring the beer up to your nose the aroma really gets your attention, dank green hops and tropical fruits like mangos and passion fruit. I don’t normally use the descriptor “dank” to describe a beer’s aroma, but for this aromatic beer it seems appropriate. Coming to the taste the tropical fruit flavors come first before transitioning to a finish that is heavy on the pine and dank green hop character of the beer. There is a decent amount of bitterness that grows as the drink proceeds, leaving you with a finish that is quite dry, almost astringent. I’ve been sampling a number of New Zealand hop beers lately (see my reviews of Kiwi Rising and Green Bullet) looking for one that I like, without very much success I might add. I have to say that Golden Ratio IPA is one of the best I’ve tried so far. The mixture of the dank green hops and tropical fruits is a unique combination that I’ve not encountered before. Do I love this beer? No, but I did enjoy it and I give it high marks for originality. I don’t think this is a beer for everyone, but if you are a bit of a hophead and you have a taste for Southern Hemisphere hops I’m confident you will really enjoy this beer. As for me the NZ hops don’t quite do it for me and I’m still searching for my go to Seventh Son beer. Is this beer out for a while? I was hoping to grab a growler myself. I have the feeling that it will be in the regular selection for a while, provided the supply of hops from down under holds up. It was on tap in late November and again in late December when I visited. The Ohio Tap Room in Grandview has it on tap right now. Sometimes you can find it at Savor Growl. If you are looking for a new local beer to try I’d recommend picking up one of the Sideswipe beers. I had the Saison and was very impressed, plus you can get a bottle at Weilands, Savor or Palmer I think.